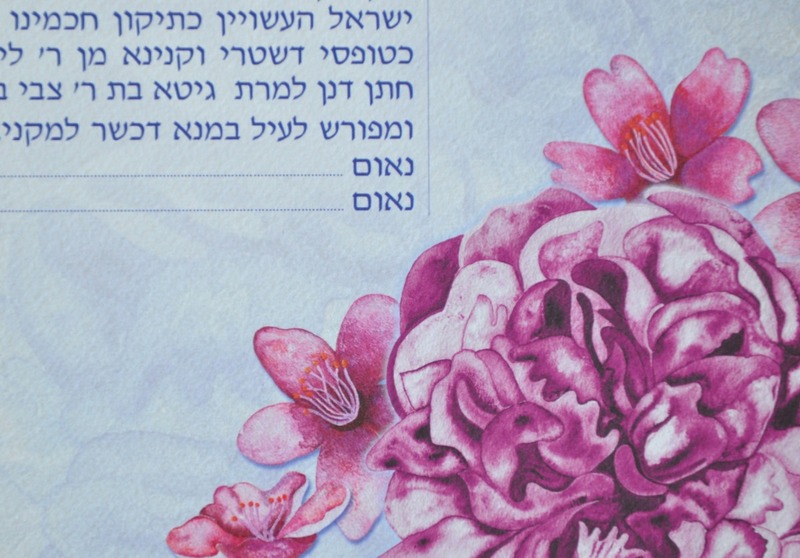 Showcasing a duet of chrysanthemums and cherry blossoms as the visual harvest for this Ketubah invites many associations of blossoming, nature, beauty, love and transitions. 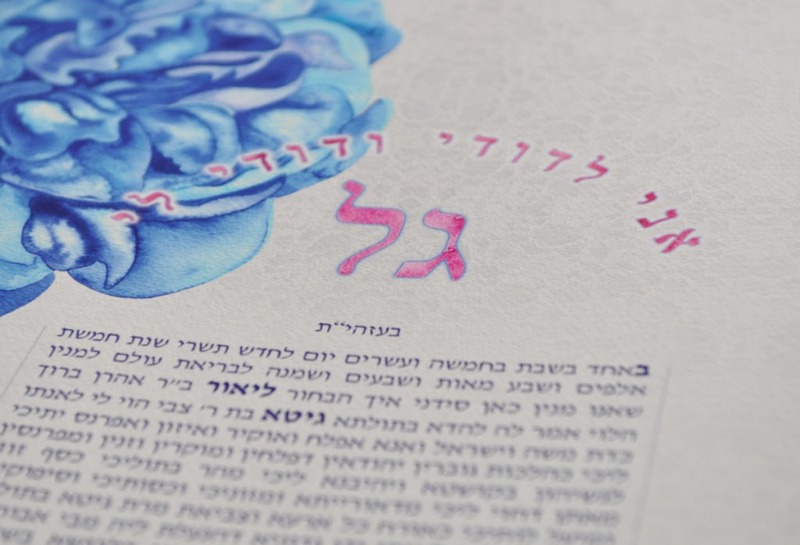 Here striking, detailed and elaborate blue and pink unfurling chrysanthemums, diametrically balanced are the centre piece of the design and enact the role of a fertile visual source of inspiration and colour for the wedding décor, as well as appearing on the wedding desert cookies. The flora motifs are painted in a family of watercolours which wash into each other as characteristic of the medium, whilst the petals have a textural dimension achieved through the glazing and layering of paint. In Japanese culture, cherry blossoms represent the beauty of life, whilst being seasonally a marker of Spring, as the seasons of love transition into one another. As the wedding is in the centre of Australia’s Spring, the cherry blossoms which dance around the pink chrysanthemum are a quintessential symbolically Spring flora. 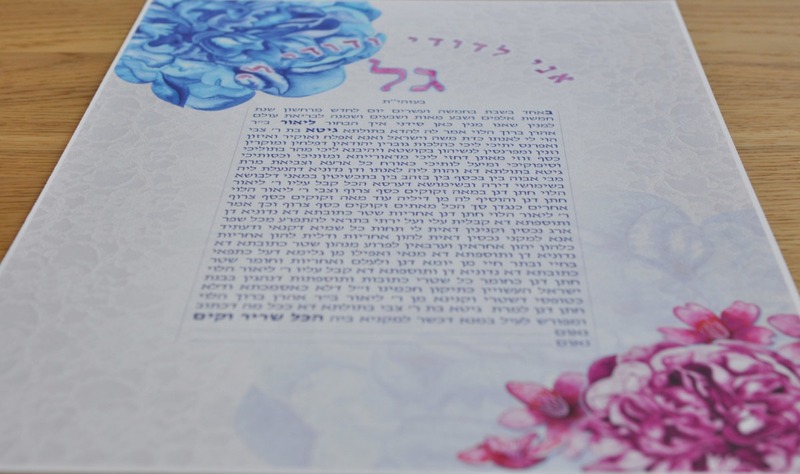 Their presence is an ode to Spring and in this way the Ketubah artwork is a mirror of the time and season in which the wedding occurs, thus allowing the Ketubah to reflect dimensions of the marriage ceremony itself. Ultimately this Ketubah is a celebration of the blossoming and beauty of love, and glorifying the blooming of new horizons and chapters associated with the fresh growth of life unfurling into a spring awakening. 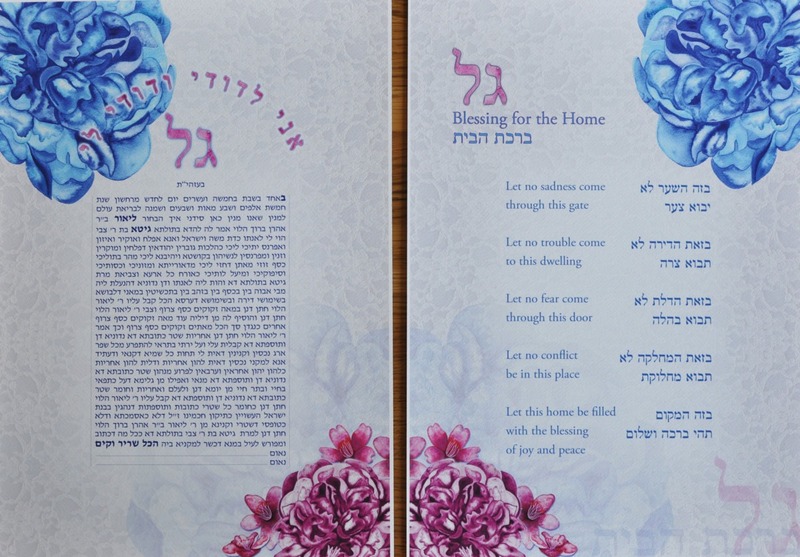 The hymn “אני לדודי ודודי לי – I am my Beloved’s and my Beloved is mine” (Song of Songs – Shir HaShirim 6:3), a romantic declaration written by King Solomon which expresses the affinity between husband and wife wraps around the initials of the couple in a dome configuration. This gesture of an enclosure symbolises the home as well as reflects the intrinsic commitment, care and responsibility mutually undertaken by husband and wife in their future lives as one union. 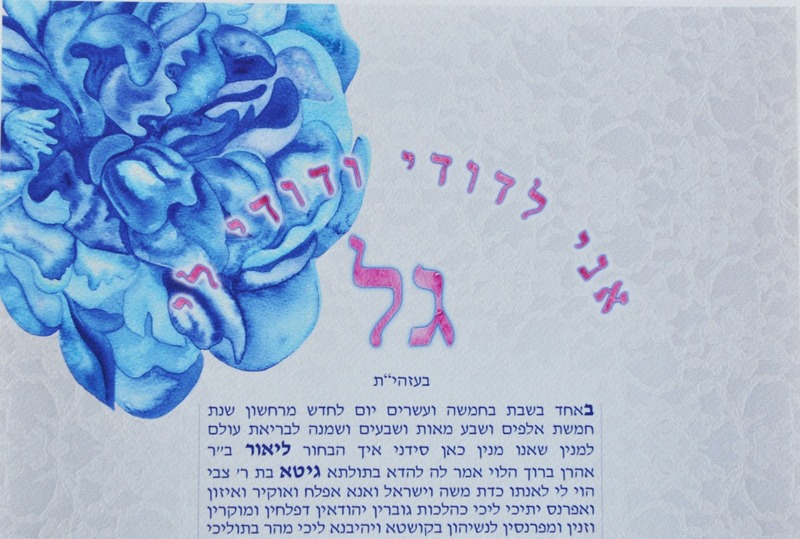 The initials and “אני לדודי ודודי לי”are painted in corresponding bleeds of pink water colour, with a soft blue glow to visually connect with the blue chrysanthemum. 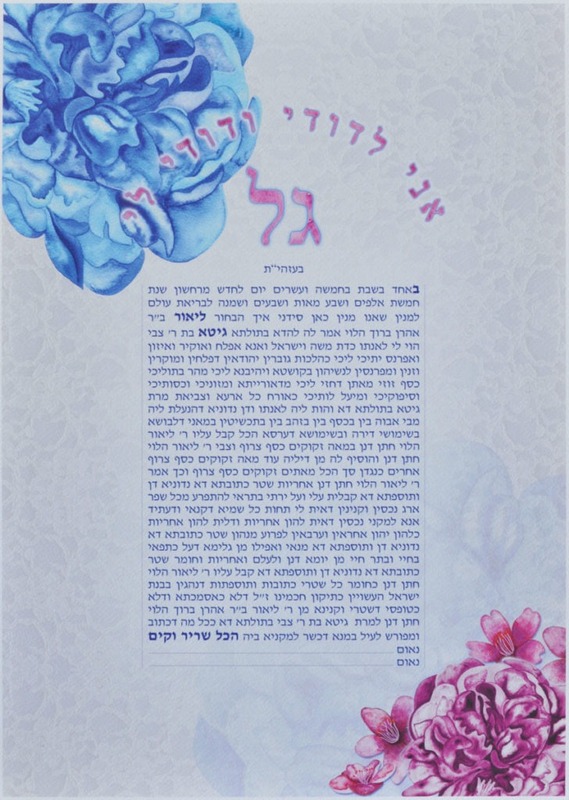 Together with the pink flowers have a soft blue drop shadow, (this blue is used as the accent for a halo that softly glows off the initials and psalm), the recursive iterations of the colour palette in this composition achieves visual harmony and balance. This colour palette reflects the primordial and essential nature of the love. The background material underlay of floral lace accentuates the bridal motifs as well as providing an intricate and organic backing for the composition. 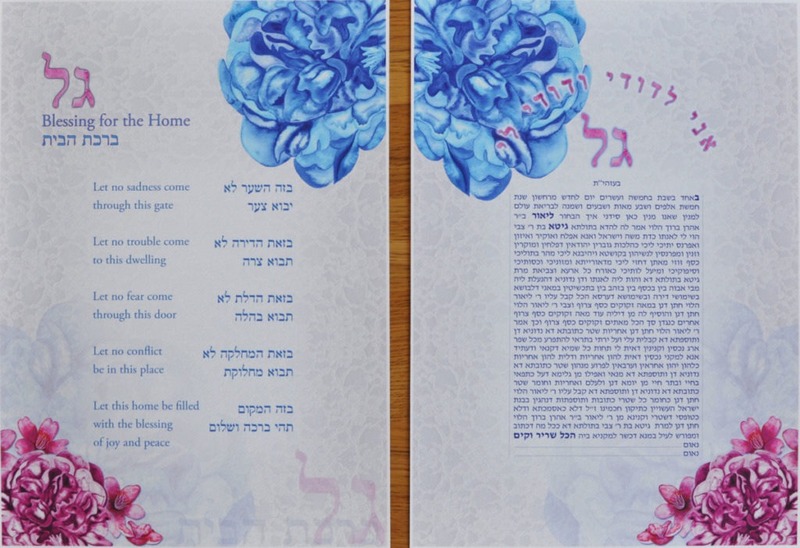 A matching Birkat Habayit was gifted to the couple and is a perfect accompaniment when hung in their next home, adjacent to the Ketubah.